Audrey Nickel is an Irish speaker, teacher, and singer who shares her home in the Santa Cruz Mountains of Northern California with her long-suffering husband (who is gradually picking up Irish in sheer self-defense! ), a miniature poodle (who only responds to commands in Irish), two twenty-somethings (who have no interest at all in Irish, but are lovely people nonetheless), four harps, and about 40 tin whistles. Audrey’s journey with the Irish language began when she worked as a volunteer in the Folklife Festival at Expo ’74 in her hometown of Spokane, Washington. She fell head-over-heels in love with the Irish traditional music that she heard all around her, as well as with American folk music, much of which draws heavily from Irish and Scottish sources. That passion for the music quickly became a passion for all things Irish: history, folklore, literature, and, of course, language. Learning sources for Irish were rather thin on the ground in Eastern Washington in the 1970s, but with the internet came a world of opportunities. Audrey began studying Irish seriously in 2004, and never misses an opportunity to speak, sing, or listen to it! I’m writing a series of stories about a psudo-scotish monarch who’s taken the reign name meaning ‘Sword In Stone’ which I have translated as Clayicloch, and your point about context has me more than worried. Send the correction to ironwood dot edward at gmail dot com. Edward, Scottish Gaelic and Irish are different languages. I have Irish; I don’t speak Scottish Gaelic. I suggest you visit http://www.irishlanguageforum.com. There is a Scottish Gaelic sub-forum there, and I know they’d be happy to help you. You have to register, but it’s free. Audrey, I’m so delighted to find your blogsite and this hilarious if slightly sinister post about how Even Racists Get the Blues. My Gaelic is not as good as it should be but I listen to the news on TG4 every night to keep my ear tuned. My brother is a US citizen and lives in Palo Alto. He moved there in the late ’70s to work with Atari and while he lived in SF he taught night classes in Gaelic. That’s very cool! I wonder if I know your brother…does he ever go to the Deireadh Seachtaine Gaeltachta in SF? TG4 is such a wonderful thing (and even better now that they have Irish subtitles available!). I’m a major Ros na Rún addict, myself. I don’t know much about what he does on a day to day basis. He’s retired now, likes his wine, hill climbing and his family. Hi Audrey, I took a Irish speaking class from you and Mary McLaughlin along with a singing in Irish years back. Just returned from a great trip to my family homeplace in Kilrea Northern Ireland. I got to stay in Cushendun where Ardicuan is located. I stumbled across your site and ordered you tatoo book. I did get hung up on the dialect thing. I live in Scotts Valley. Is there any resources in our area to interact with beginning level Irish speakers? I appreciate your passion to keep and kindle the Irish language. 3 weeks ago I lost my “soul mate “, love of my life, fiance of 4.5 yrs. Joseph Reed. Both of us only 40 yrs old. He was of Irish decent. He had many tattoos (mostly jailhouse) but all of Celtic or Irish origin. I have no tattoos and I read your translation of “eternal love” “Mo Shíorghrá” . 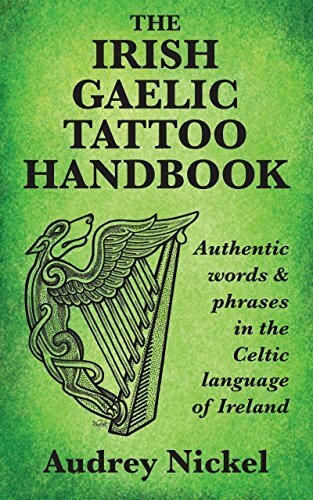 I am getting a tattoo and also want “my heart connected to your heart, your soul to my soul” can you tell me if there is a translation for that phrase in Gaelic? Oh, Laura…first let me say I’m so, so sorry for your loss. This is so very important, I think it’s vital that you take your request to the folks at ILF (www.irishlanguageforum.com). I recommend this to pretty much everybody, but especially when it’s something this important. You have to join, but it’s free. Go “An Fóram Mór” (the main forum), and explain why you want the translation. You can also tell them that “Redwolf” sent you. That’s the best way I know of to get a very accurate, well-thought-out tattoo translation.